I haven’t been playing recently, but I have kept up with some of the major events. Unlike the Pearl Spring or Tal Memorial super-tournaments, though, I didn’t get a set of predictions in for the London Chess Classic. There are still two rounds to go, but GM Luke McShane is surprisingly in a tie for first – maybe leaving the vampire-squid on the face of humanity is good for one’s chess? I can’t remember anymore, but this may have been my first win against a master, back in 1994 at the People’s Tournament in Berkeley, CA. In the first round, I was white against Frank Say (2306). I was about 9.5 years old and rated about 1800. The game started off in typical fashion for me back then – with a sketchy gambit. 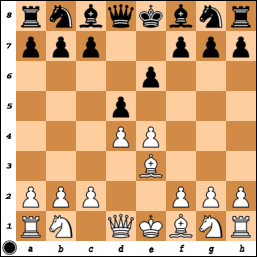 I’m not sure what the exact name of this opening (1.e4 e6 2.d4 d5 3.Be3) is, but I used to call it the French-Mar-Diemer Gambit. Growing up on a steady diet of Morphy and Anderssen games, gambits were my thing and I rarely hesitated to throw a pawn or two away. Almost all of Richard Shorman’s students play this way (at first, at least), and I was no exception.